Like other parents, I don’t hold back preparing for fall just because of hot, sun-drenched sunny days. But my preparations don’t entail trips to the store for notebooks, pencils, rulers, and other school gear. My daughter is old enough to gear up for herself. Instead, I’m preparing for a garden that becomes lush with ”cool weather” vegetables just as tomatoes, peppers, okra, and other warm weather vegetables are fading OUT. Much of gardening entails NOT going with your gut. If I went with my gut, I’d be planting more tomatoes and sweet corn and, perhaps, if I was really going with my gut, even banana trees on today’s ninety plus degree, bright, sunny, humid day. Although tomatoes, peppers, and cucumbers presently have more appeal, fall vegetables will have their day. I have to remind myself how a lowering sun and cooler weather make more appealing the lush green leaves of cabbages, brussels sprouts, endive, lettuce, kale, celery, and, below ground, radishes, turnips, carrots, and celeriac. And anyway, I’ll have no choice because summer vegetables will have waned by then. That lush fall garden, almost like a whole new garden, comes about only if I do something about it now! Timing is (almost) everything for a productive fall garden. Planted too early, some leafy fall vegetables bolt — send up tough seed stalks — because of heat and long days. Right now, I’m sowing turnips and winter radishes, the especially tasty varieties Hakurei and Watermelon respectively. 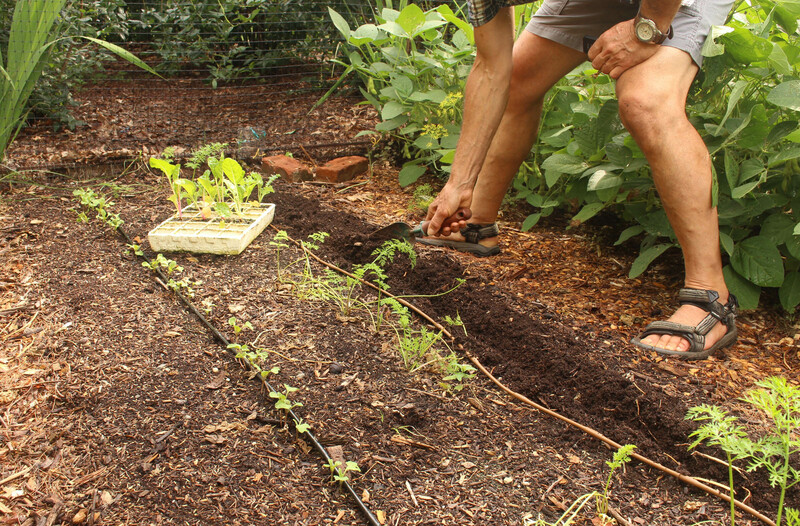 Among leafy, salad vegetables, lettuce, mustard (the variety Mizuna), and endive, with repeated sowing of lettuce every weeks until early September. It’s still a too early for spinach, arugula, mâche, short season Chinese cabbages, and spring radishes. Some time later this month would be about right for these vegetables. My book, Weedless Gardening, gives a detailed schedule for when to plant what vegetables for specific regions. For a truly bountiful fall garden, more advance planning was needed. For instance, I won’t be harvesting brussels sprouts until October, but for sprouts lining stalks three to four foot tall, I sowed those seeds indoors in March. Celery and celeriac seed got sprinkled in mini-furrows in seed flats way back in early February. Almost as important as timing for my fall garden is weeding. The enthusiasm of many gardeners peaks in spring and then slowly wanes as summer heats up. Not mine. With weeds kept in check through June, much less effort has been needed to maintain the status quo. Mostly, this is because drier weather has limited weed growth and seed germination, and because any watering in my garden is with drip irrigation. Rather than coaxing weed growth in pathways (and also wasting water), as do sprinklers, drip irrigation pinpoints water to garden plants. Back to enjoying summer . 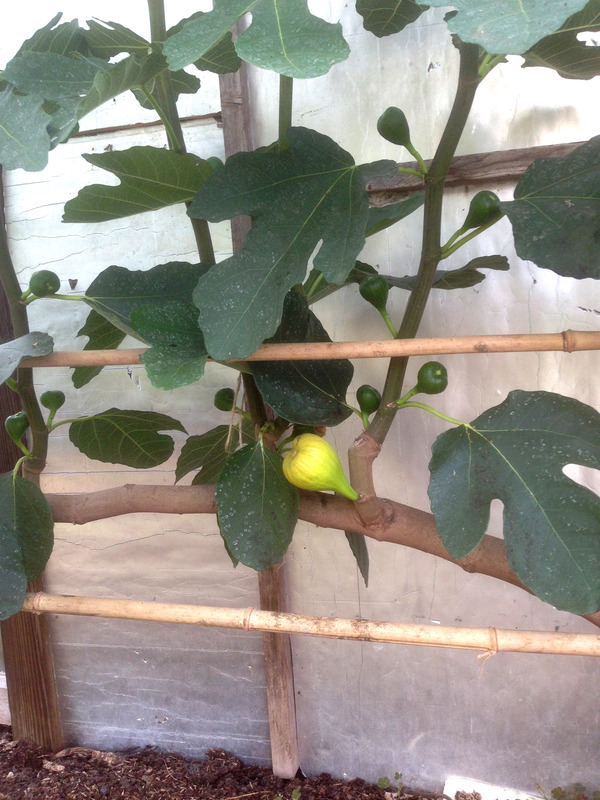 . . we’ve been enjoying the first crop, known as the breba crop, of figs from the ‘Rabbi Samuel’ fig tree espaliered in the greenhouse. Most fruit plants bear fruits on one-year-old, or older, stems. Figs, depending on the variety, can bear on one-year-old stems, on new, growing shoots, or on both one-year-old stems and on new, growing shoots. ‘Rabbi Samuel’, I have found, bears on both. The tree is trained to a T, with two horizontal arms growing in either direction from atop an 18” high trunk. New shoots spring up vertically at about 6 inch spacing along the arms. Late each fall, I cut all those shoots almost back to the arms to make room for and coax new fruiting shoots for the following year. The stubs left after cutting back the season’s shoots are one year old, and that’s where brebas have been borne. This fall, I’ll leave some a few inches long, for a larger breba crop next July; the next year I’ll shorten them more drastically and leave others a few inches long; and so on, year after year. The main crop, on new, growing shoots, should begin ripening not to long after the last of the brebas have been harvested. With sufficient sunlight and a bit of supplemental heat in the greenhouse, harvest of the main crop will continue until November’s days grow too short, soothing the transition from the summer to the fall garden. This entry was posted in Fruit, Gardening, Planning, Vegetables and tagged breba, espalier, fall planting, Ficus, fig, lambsquarters, purslane, weeds. Bookmark the permalink. Trackbacks are closed, but you can post a comment. Staying on top of the weeding has been tough for me this summer – just one weed that keeps spreading by underground runners. Almost makes me want to abandon my gardening philosophies regarding chemicals!!! Thank you for the info on figs. I have one that I’d like to train to a particular shape and I didn’t know about how the brebas grow. Please elaborate if what you’re talking about is something more than clinging to nutrients that might otherwise leach out and contributing to the store of soil organic matter, which helps release nutrients from the soil matrix in addition to making soluble nutrients more available to plants. No small things, these benefits, but any plant will do this. Anything special about lambsquarters in this respect? I commend your discipline! I fully intended to weed today but it is awfully stinking hot and after walking the dog I decided I’m really not in the mood – which is why of course, my weeds are out of control. I am much more content to sit on the porch with a cool drink and watch the butterflies flutter, but who knows, the day is not over yet. I did plant some more beans and a few lettuce crops not too long ago. They are probably drying up. Thank you for your inspiration! 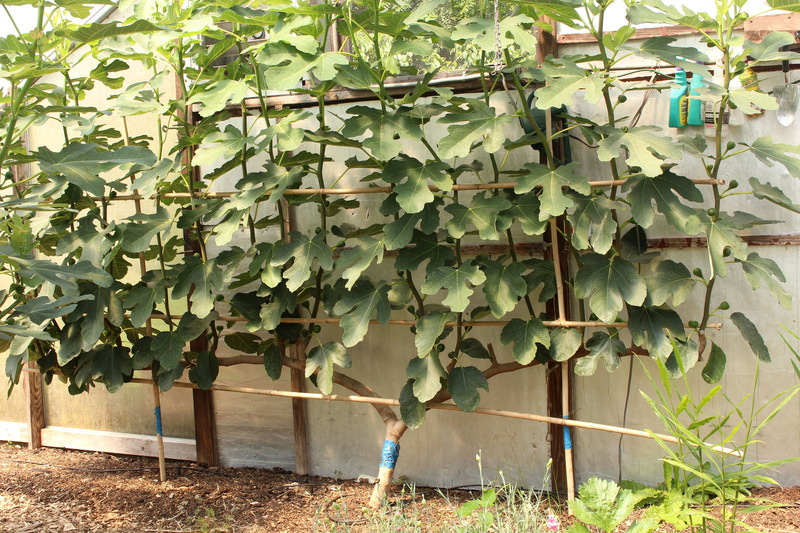 That is the best picture/demo of an espaliered fig I’ve seen yet! Do you think doing this along a wall of a house in a climate similar to your greenhouse (but outside!) will work, or will all the heat stored in the wall burn the fig tree? I have a very small space to garden, but the idea of landscaping with fruit is very attractive to me! Love your examples and practical approach (with science!). I recently “discovered” you through Margaret Roach’s podcasts and have been haunting your site and other work since. I live in the Deep South so trying to keep in mind my lack of chill hours while trying the fruits you recommend. Figs should work wonderfully for me, if I can keep up with the watering. My greenhouse technique for training a fig should definitely work outdoors in a mild winter climate. I do have to prune the uprights periodically to prevent them from growing too tall; my greenhouse is only 11 feet high. You like the idea of landscaping with fruit? I wrote a book with that title!